This past week, LCROSS and LRO were finally mated together, LCROSS on the bottom, and LRO on top, as I described on my 5/13 post. 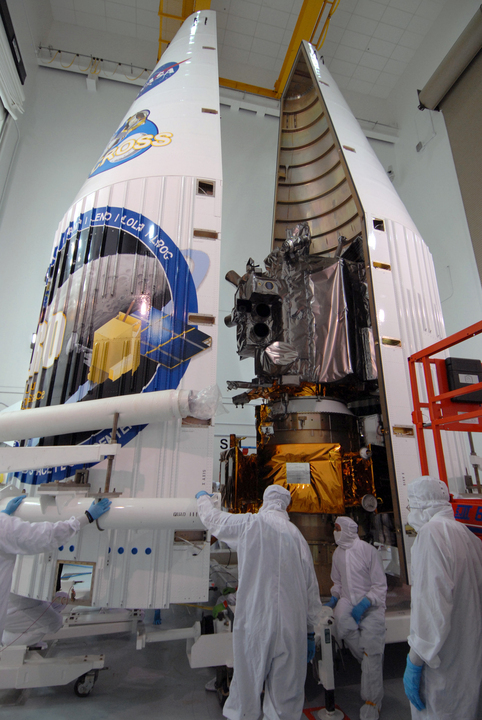 On Friday, both spacecraft were encapsulated inside the Atlas V payload fairing, the sleek nosecone of the launch vehicle. Now that they are inside, they will remain in this cocoon until they are released into space after launch. Seeing this in photos brought a strange sense of finality to the whole development. Years of effort, and now the team is done designing, done building, and nearly done testing. It really comes down to the launch team and the operations team now. Launch is one month away! Here’s a photo of LCROSS and LRO, united at last after years of independent development in different facilities – LRO at Goddard Spaceflight Center, Greenbelt, MD, and LCROSS at Northrop Grumman in Lanham, MD and Redondo Beach, CA. LRO is the silver-colored spacecraft, LCROSS the gold-colored spacecraft. Having never seen LRO, members of our flight team were stricken by how different the two spacecraft look. 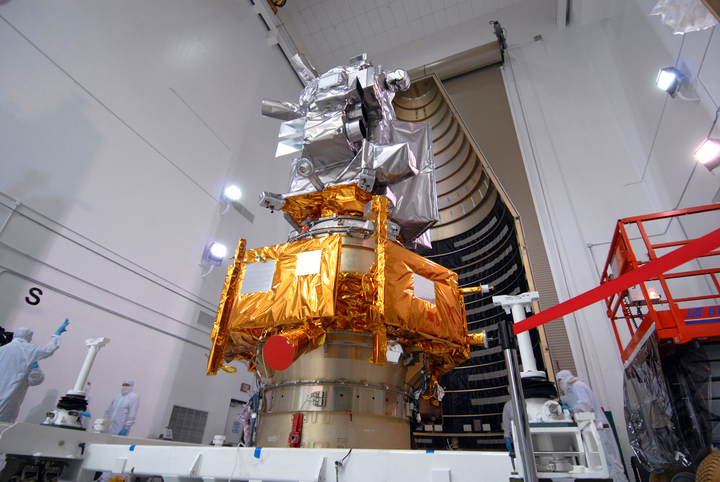 Both are covered in Multi-Layer Insulation (MLI for short) that protects the spacecraft from the harsh thermal environment of space. But the kinds of materials each spacecraft uses in their MLI are tailored to their respective missions – their orbits, how long they expect to dwell in the shadow of the moon, which sides of the spacecraft will face the sun, the sensitivity of some spacecraft elements to heat and cold, and the amount of heat specific electronics units produce. So what’s the big deal about mating the two spacecraft together? You might think that connecting two spacecraft together would simply mean bolting them, but in reality, the interfaces between LCROSS and LRO, and between LCROSS and the Centaur, are pretty intricate. Most importantly, the mechanical interface between each vehicle has to be entirely reliable during launch so as not to damage either spacecraft or to amplify vibrations that might endanger the stability of the launch vehicle. For LCROSS, since we carry the Centaur with us for most of our mission, this connection persists for months beyond liftoff, all the way to 10 hours before lunar impact. However, each spacecraft must also be able to reliably separate from the rest of the stack. This is a tricky operation. On command, the mechanism holding the spacecraft must transform from an ultra-solid connection, to one that releases and pushes the two pieces from each other using strong springs. The release must avoid snags, and must provide a good push off – just the right amount of speed, as little rotation as possible, and without re-contact! Aside from the mechanical aspects, there are a number of electrical connections bridging the interfaces. On the pad, the Centaur acts as a conduit for telemetry data from both spacecraft on the launch pad so that both the LRO and LCROSS teams can monitor spacecraft health immediately prior to launch. Just after the stack leaves Earth orbit, the Centaur also sends the signal to activate the separation mechanism between LRO and LCROSS. That means data cabling has to somehow get from LRO to the Centaur, with LCROSS in between. LRO’s data lines cross the LRO-LCROSS boundary, run down the side of LCROSS, and across the LCROSS-Centaur boundary. In the meantime, LCROSS launches powered off. Some time after LRO separates, the Centaur also sends signals commanding LCROSS to wake up, and other signals to notify LCROSS it is time to take control of the Centaur. All of these electrical connections cross the separation planes between the vehicles. The connectors must reliably transmit data after the rough ride to orbit, but then disconnect when they’re supposed to at separation. Here’s a parting shot of LCROSS. If all goes well, we’ll not see it again. During the mission, we can only imagine how it appears on its way to the moon. In October, that spacecraft will have its final, brief hurrah in just 4 minutes of data transfer back to Earth, observing the Centaur impact. At the end of that 4 minutes, it too will impact, and will become part of the moon. Did you remove the cover, shown in red, to the star tracker seen in the top photo? Most of the red-tag “remove before flight” items were removed prior to encapsulation, including the star tracker dust cover. A couple items remain, a dust cover called the “shower cap” on the POD (Payload Observation Deck)- left there because the instrument optics are pointed up in the launch configuration and don’t want particulate settling there. There are also IFJs (In Flight Jumpers) that electrically place the vehicle in the final launch configuration, for example allowing power to the propulsion valves (electtical safety issues primarily). There will be one more access (at least) to finalize these items prior to flight – access is made through the boattail doors in the fairing adapter at the top of the Centaur. There’s a chance we will also need to aim the two MGAs (Medium Gain Antennas) which are optimized for earth pointing angles during the lunar swingby and lunar impact events. It’s very interesting to see some of the safety precautions that go into the clean assembly of such a delicate piece of equipment. Then to imagine that it’s going to undergo extreme forces during launch and ram the moon at great speed. Thanks for the write-up Paul, and good luck in the upcoming days! This is some very cool work.